Was the Red Flag Flying There? examines the Palestinian/Arab-Israeli conflict through the lens of Marxist politics. Joel Beinin asks how the proposal to partition Palestine into an Arab and a Jewish state—a solution endorsed by international consensus in 1947-49—became an obscure and even unthinkable option by the mid-1960s. As the most consistent adherents of the two-state solution both before and after the establishment of the state of Israel in 1948, the Marxists serve as the focal point of his analysis. Beinin discusses three Marxist political formations in Egypt and Israel: the communist movement in Egypt; the Communist Party of Israel (MAKI); and the United Workers' Party of Israel (MAPAM), which attempted, but ultimately failed, to sustain a dual commitment to Marxism and Zionism. The failure of these movements and their progressive abandonment of an internationalist orientation toward resolving the Arab-Israeli conflict is explained as a consequence of the ultimate hegemony of nationalist politics in both Egypt and Israel. Employing both the analytical methods of political economy and a discourse analysis informed by insights drawn from Antonio Gramsci's conception of hegemony, Beinin offers a new interpretation of the significance of Marxist politics in Egypt and Israel. 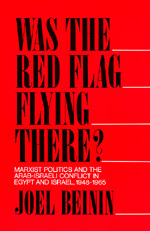 This work builds on and extends the scope of the revisionist history of the Arab-Israeli conflict developed by Israeli scholars during the 1980s, challenging traditional Marxist conceptions of the relationship between anti-imperialist nationalism and the struggle for socialism. Joel Beinin is Assistant Professor of History at Stanford University and the co-editor with Zachary Lockman of Intifada: The Palestinian Uprising Against Israel: Occupation (1989).